Our lives here at TFA headquarters have gone through a lot of transitions in the past several years, but for me personally, none of those periods of growth or change feel quite as difficult as the one we're in right now. Micah has just started daycare and logistically speaking I should be just sailing through this shift, dancing around my house, going up and down the stairs willy-nilly without worrying about baby gates! Leaving cups of coffee and WIP's laying around! Sitting down and eating lunch peacefully and quietly!... but instead I'm finding myself a little lost these days. I miss my buddy! Maybe I also miss my excuse for not sitting down and focussing on my to-do list? I think that might be a big part of it. When I was pregnant with Rowan I had a lovely and easy pregnancy, I worked right through it and barely slowed down. I was totally unprepared for how challenging it would be to juggle a baby and work and I paid for it. When I became pregnant with Micah I vowed not to make the same mistake again and took it easy right from the get go. I was a champion at resting and relaxing and letting myself off the hook. I made sure that work got done and since I love my work I didn't find it difficult to make time for it, but I didn't push myself any harder than I felt I could handle. It was the right thing to do as our first year as a family of 4 was amazing. All along I knew that Micah would be starting daycare in the fall of 2016 and that is when I would buckle down and get back to work and do all the things that I de-prioritized in order to focus on my time with him. And now it's fall 2016, Micah is currently at his first full day of daycare and I feel this very strong sense of responsibility to get to work and be super productive. For the past two years any time I would get an idea that was too involved for the stage that I was at at the time I would write it down and make a mental note to "get to it when Micah starts daycare". Oof. It's a long list, which I guess is really quite exciting right? The past few years have been incredibly fulfilling for me and I know that they have taught me a ton about balancing work and life. For me, the two will always be incredibly intertwined, but I have gotten much better at realizing that there is life outside of my yarn filled office and that spending one on one time with my boys is something that I'll never regret. It's terrible that it's taken me this long to really have that sink in, but I guess I'm just a slow learner. Hmm, this is turning into quite a long and rambling blog post isn't it? At the end of the day, I think that what I'm trying to say is, bear with me ok? Since this is a random blog post I've included a selection of random images from my Instagram account. 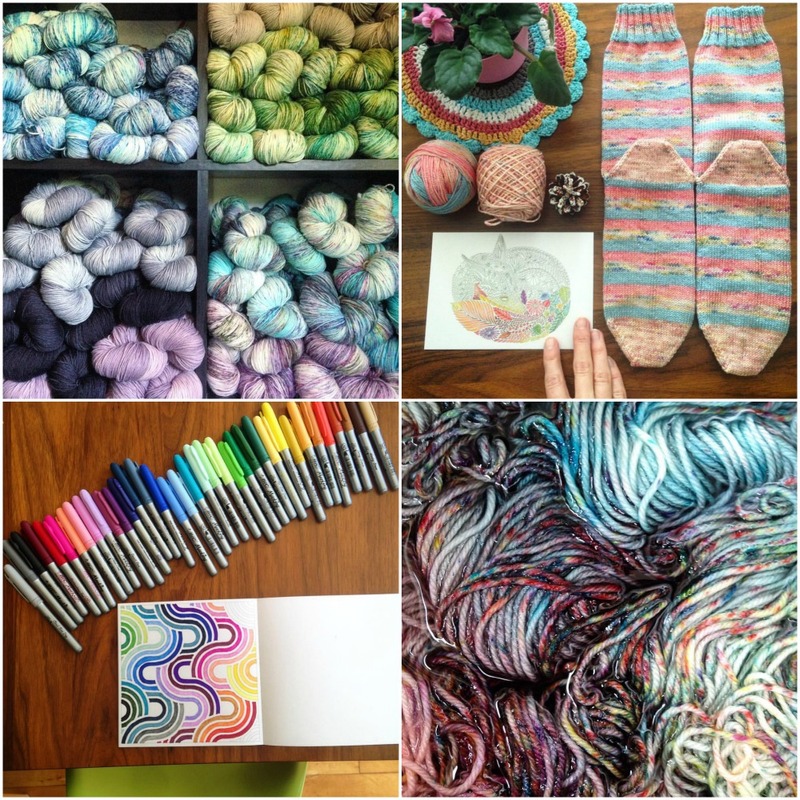 Yarn, colour, knitting and boys. That's my life. Above is my project for the TFA Blanket KAL that technically wrapped up yesterday but which I'm thinking of extending for another week since I haven't finished the border on my blanket yet! It's nice though. I love it. Alright, so that just about wraps up my super scatter-brained blog post for the day. Hopefully I'll be back soon with a few more coherent thoughts. As my girl CaterpillarGreen said today "Things got real Septembery around here..." So maybe it's not just me, maybe life is just wild this time of year for all of us?